Quarter Amish is in the midst of blackberry season and the plants are being quite generous! Customers share they enjoy the picking experience, but many don’t know quite what to do with the berries they just picked. Berries are one of the easiest items to preserve for later use. To freeze berries, lay in a single layer on a cookie sheet and freeze until firm. Bag in freezer bags marked with the date and berry type. I use a vacuum sealer because contents keep longer without freezer burn, but quality freezer bags work great too. To use frozen berries, remove the amount you require, reseal the bag, and return to the freezer. After I open a vacuum sealed bag, I place it into a ziplock freezer bag before returning to the freezer. Making jam is an easy process that yields a sweet delight. Jam is one of those things that give reason to have toast in the morning or biscuits for supper. Jam also is frequently shared with others as a gift or token of friendship. Jam can be used as a condiment or as an ingredient. I love to use fruit jams on pancakes, waffles, french toast, and frosting for cakes. I also use jam as a marinade for chicken and pork roasted or grilled meat dishes. I list the suggested amounts to make a batch of jam yielding approximately 3 pints or 6- 1/2 pints. The rule of thumb is 2/3 c sugar for every cup of crushed berries in case you don’t have exactly 9 cups. Use a potato masher to crush berries to a consistent texture. If you wish to have seedless jam, remove the seeds from the pulp by forcing crushed berries through a sieve/strainer. It takes a varying amount of time depending on which equipment you choose to use. The process is the same for either of the items shown above. Crush the berries then using a spatula or pestle force the pulp through the sieve. Expect to spend 15-30 minutes removing seeds unless you use something like the Norpro Sauce Maker food strainer. The Sauce Maker can be used with a variety of food items and takes about 5 minutes to seed enough berries to make a batch of jam. Pour the fruit in the top, turn the handle and catch the pulp in a shallow container. The hand strainer costs between 5-15 dollars, the jam strainer about 30-40 dollars and the sauce maker between 50-60 dollars. For those of us on a budget, summer brings canning supply sales at local stores and fall brings clearance sales; so keep your eyes open. If you frequent yard sales, auctions, or thrift shops you might be able to find these items for just a few dollars each. Combine the berry pulp and sugar in a large saucepot. Bring slowly to a boil, stirring until sugar dissolves. Cook rapidly to the gelling point. Mixture will thicken and requires frequent stirring to prevent sticking. Ladle hot jam into hot jars, leaving 1/4 inch head-space. Adjust two piece caps and process 15 minutes in a boiling-water bath canner. A word about jars and lids…..Wash jars in hot soapy water and rinse in hot water. You can also run jars through the dishwasher to clean and sterilize. Do this just prior to filling to keep jars hot. If you put a hot product into a cold jar the glass could break. Care must also be taken with the lids. If using two-piece lids, hold lids only in boiling water until used. Immediately after filling jars wipe the rim with a damp cloth to remove any drips then using a magnet wand to remove lid from boiling water bath and place on jar. Use the band to screw the lid down firmly. Place the jars in a water bath canning rack and gently lower into hot water. Wait until the water returns to a boil then begin the timer. After 15 minutes of boiling, lift the rack and remove the jars with a jar lifter. Place on a towel with enough space between jars to allow even cooling. As the jars begin to cool you will hear the “ping” as the lids seal the jars. Leave for 24 hours undisturbed. Remove the screw band and check to make sure the lid has sealed tight, then wipe jars to remove mineral deposits and mark with contents and date. Jars are usually stored with the bands removed so they don’t rust into place. If the jars are taken out of the home or given as gifts replace the band to prevent accidental opening of the jar. Soft spreads can be made without using pectin because many fruits contains enough natural pectin to thicken the spreads naturally. Soft spreads continue to thicken as they cool and the exact thickness of the final product cannot be determined at the time of cooking. For a softer spread shorten the cooking time and for a thicker spread extend the cooking time. Depending on the type of berry used it may take up to two weeks for the product to gel; although most recipes gel within 24 hours. I use the spoon test when making jam most often. Dip a cool metal spoon into the boiling jam. Remove from heat and steam and tip the spoon allowing contents to spill. At first drops are light and syrupy. As cooking continues the drops become larger and thicker. When the gel point has been reached the jam sheets off the spoon in a congealed flake. You can also test for gelling by dropping a small amount of jam onto a chilled plate. Place in freezer briefly then remove and allow to reach room temperature. Gently run a finger through the mixture. If it separates then slowly returns to original, it is ready to process. Jam making is a simple pleasure which preserves summer’s rich scents and flavors. Preserving your own allows control over the ingredients and the final product makes a great gift for those we care about. 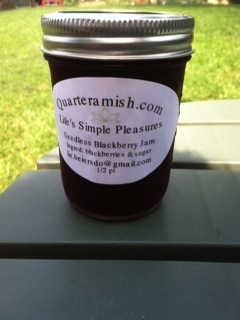 Why not be adventurous and try making blackberry jam soon! 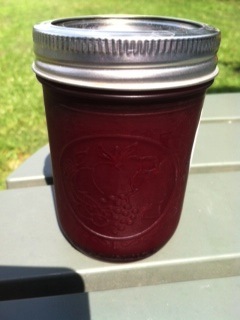 Seedless Blackberry Jam processed and ready to be eaten, stored, or shared with others. Jam makes a great gift. This entry was posted in activities, DIY, food preservation, gift ideas, Life's Simple Pleasures, PYO berries, Recipe and tagged blackberry jam, breakfast, crushed berries, food, freezing berries, gel point, home canning, jam making equipment, making jam, making seedless jam, Quarter Amish berries, vegetarian. Bookmark the permalink. I used an immersion blender instead of my potato masher to make a smooth seeded jam. I cooked until the gelling point and then canned for 20 minutes or so. The result is a delicious jam that is very good and husband-approved. Thank you for making a jam recipe without pectin.